Junior Tideway Success and End of Head Season Roundup. Whilst the Beasts from the East laid claim to a number of heads across the country in the first part of 2018, including Yorkshire Rowing’s Yorkshire Head, YCRC crews grabbed every chance they could to shine. February saw YCRC kicking off 2018 at Tyne Head, with our junior squad bringing home not only WJ15x+, J184x- but also the senior W2x, with our senior Men winning in a 4+. Later in the month, YCRC trekked back north for the Trent Head, where our J184x- repeated their Tyne win, along with medals for the J14 4x+ and the WMasD/E 8+. In March the pinnacles of the head season loomed with WeHORR, HORR, and School’s Head held over three consecutive days on the Tideway. Whilst injury meant our women had to scratch from WeHORR, HORR saw two YCRC eights on the Thames – the seniors moved up the start order to secure 139th, whilst the juniors (and Paul B) had an absolutely storming row to finish 126th. Well done to both crews! 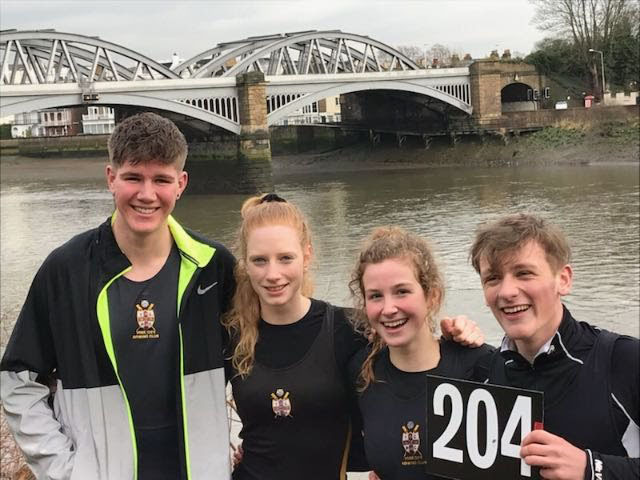 The icing on the Tideway cake came at School’s Head, when some of our most experienced junior athletes teamed up to take 1st in the Mx4X- by 15s. A fantastic achievement for Josh, Lucy, Katarina and Alfie, setting a brilliant example of perfomance on the national stage to juniors and seniors alike – the pennant will look quite fabulous in the newly-refurbished club bar! For the last head race of the season back over the Pennines, it was no April fool’s joke that YCRC came home with a fabulous seven wins from Northwich Head: WJ16 1x, J154x+, WJ15 2x, WJ14 2x, J154x+, J14 4x+ and WMasD4x-. Of the rest of the 15 YCRC crews, all came at least third in their events, a superb day of racing. The victorious YCRC Mx4x- at School’s Head 2018. A big thankyou to all involved in getting the various crews and their kit around the country despite the early starts, and chilly riverside waits – in particular our Boats Officer Paul, who in addition to bringing home two of the above wins, has towed the boats of YCRC and our Ouse friends up and down the country. Thankyou Paul!